BSTPL-17, GSM/GPRS/GPS Vehicle Tracking Unit. BSTPL-17 is a compact, rugged and most advanced Vehicle Tracking Unit made with combination of GSM/GPRS and GPS technologies. Built with most advanced 32 Bit; Cortex M3 Microcontroller, BSTPL-17 provides additional advantages to customers with Digital Inputs, Analog Inputs, Digital Outputs, SoS Interface, CAN Interface, RS-232 Interface, RS-485 Interface and Optional Two-Way audio communication in addition to providing location details. With built in high quality GSM Module, BSTPL-17 supports all the 2G GSM networks operating on 850/900/1800/1900 MHz frequency and supports Class 12 GPRS. Highly sensitivity GPS module with 22 Tracking & 66 Acquision Channels with -165 dBm gain provides accurate location data in toughest and difficult conditions. Easy to install, BSTPL-17 provides highly reliable and accurate data to customers like Location Information, Speed, Direction, GPS Odometer, Alerts and Other IOs related information. Supporting wide operating voltage (DC 7V to 40V), BSTPL-17 has provision for 3.7V Li-Ion internal battery with built-in charging mechanism and uses a rugged ABS plastic enclosure meeting IP65/67* standards with built in GSM and GPS antennas. 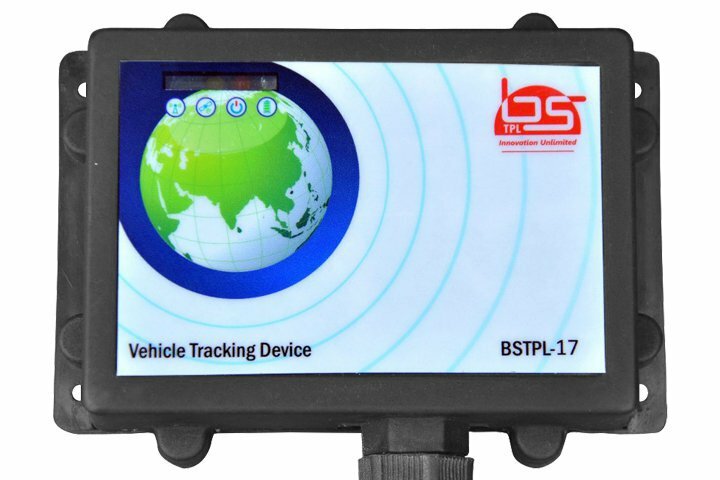 BSTPL-17 provides various alerts related to vehicle like Main Power Connection / Disconnection, Ignition ON/OFF, Digital Inputs Status, SoS Status, Over Speeding, Harsh Breaking, Harsh Acceleration, Harsh Maneuver and Box Open / Close conditions. BSTPL-17 has provision for three external communication interfaces. RS-232, RS-485 and CAN. RS-232 & RS-485 ports can be interfaced to external sensors like RF Reader, Biometric Readers, Fuel Sensors, Temperature Sensors and other 3rd party accessories which has RS-232 and RS-485 communication interfaces. CAN Port can be interfaced to Vehicle CAN interface for reading various parameters like Engine RPM, Engine Temperature, Speed, Odometer, Fuel Value, Vehicle Gear Position, Engine Status … etc. Parameters to be read from the vehicle depends on customer requirement and support by the vehicle. BSTPL-17 hardware is designed with low power consumption for long battery backup. This will also minimise the draining of vehicle battery when the vehicle is idle for long time. BSTPL-17 also supports Sleep Mode feature which reduces the power consumption to less than 10 mA. Supports Sleep Mode function for longer battery backup.